This is a playful, absurdist and yet serious performance of contemporary dance set to Bach’s Goldberg Variations. The collaboration between Swedish choreographer Orjan Andersson’s dance troupe and Glasgow’s Scottish Ensemble, questions traditional renderings of classical music where musicians are semi-hidden in the pit and dancers take the stage. 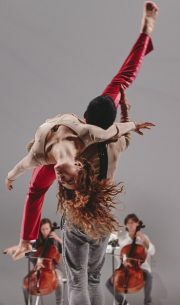 In this inventive production, Andersson animates a musical-dance dialogue between dancers and musicians where both are stage equals. Sometimes the musicians dance and this feels as if Andersson is asking his audience to question the rigidity of formal divisions. Performers sometimes speak to the audience making us aware that this work is also a comment on performance itself. Sometimes dancers sweep the stage or bring on a row of costumes to suggest that this is also part of a rehearsal. I enjoyed the mix of dance vocabulary which was sometimes balletic, sometimes reminiscent of Feldenkreis and, at moments, was a flash of Hatha Yoga. The root of Andersson’s complex dance vocabulary is influenced by his experience with Birgit Cullberg, Mats Ek and Batsheva Dance Company – who are also known for challenging contemporary dance traditions. Andersson’s extraordinarily gifted dancers are varied in body shape and training which makes Goldberg Variations ternary patterns for insomnia a richly textured intellectual and aesthetic spectacle. As for the Scottish Ensemble they are quirky and quite brilliant. The power of creativity: combining art and fashion in Florence, by Carla Scarano. Jazz Joan and Cigarettes. Clare Doyle.